4. Laboratory of Immunoregulation, Immunology Frontier Research Center, Osaka University, Osaka, Japan. Interleukin (IL)-6, a cytokine featuring redundancy and pleiotropic activity, contributes to host defense against acute environmental stress, while dysregulated persistent IL-6 production has been demonstrated to play a pathological role in various autoimmune and chronic inflammatory diseases. Targeting IL-6 is thus a rational approach to the treatment of these diseases. Indeed, clinical trials of tocilizumab, a humanized anti-IL-6 receptor antibody have verified its efficacy and tolerable safety for patients with rheumatoid arthritis, Castleman's disease and systemic juvenile idiopathic arthritis, resulting in approval of this innovative biologic for treatment of these diseases. Moreover, a considerable number of case reports and pilot studies of off-label use of tocilizumab point to the beneficial effects of tocilizumab for a variety of other phenotypically different autoimmune and chronic inflammatory diseases. Elucidation of the source of IL-6 and of mechanisms through which IL-6 production is dysregulated can thus be expected to lead to clarification of the pathogenesis of various diseases. 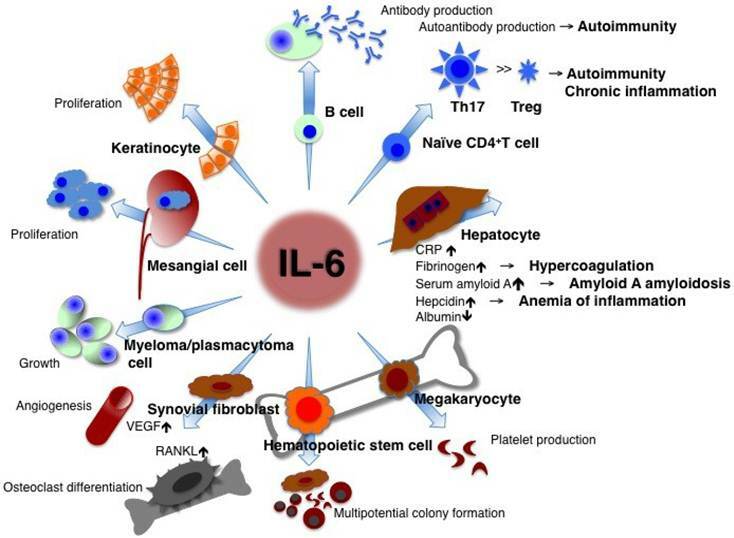 Keywords: interleukin-6, a humanized anti-interleukin-6 receptor antibody, tocilizumab, autoimmune, inflammation. Interleukin-6 (IL-6), initially designated as a B cell differentiation factor , is a representative cytokine featuring redundancy and pleiotropic activity [2-4]. In the early phase of infectious inflammation, IL-6 is produced by monocytes and macrophages immediately after the stimulation of Toll-like receptors (TLRs) with distinct pathogen-associated molecular patterns (PAMPs) . In noninfectious inflammations, such as burn or traumatic injury, damage-associated molecular patterns (DAMPs) from damaged or dying cells stimulate TLRs to produce IL-6 . This acute IL-6 expression plays a central role in host defense by stimulating various cell populations. When acting on hapatocytes, IL-6 strongly induces a broad spectrum of acute-phase proteins such as C-reactive protein (CRP), serum amyloid A (SAA), fibrinogen, hepcidin, haptoglobin, and antichymotrypsin, whereas it reduces albumin, cytochrome P 450, fibronectin, and transferrin [7, 8] (Figure 1). IL-6 has a pleiotropic effect but its dysregulated persistent production causes the onset and development of various autoimmune and chronic inflammatory diseases. IL-6 is originally found as a B cell stimulatory factor-2, which induces activated B cells into antibody production. IL-6, combined with TGF-β, preferentially induces the differentiation of naïve CD4 positive T cells into Th17 cells whereas IL-6 inhibits TGF-β induced regulatory T cell (Treg) development. As a consequence, Th17/Treg imbalance may cause the onset and progression of autoimmune and chronic inflammatory diseases. IL-6 induces production of acute-phase proteins such as CRP, fibrinogen, serum amyloid A, and hepcidin, whereas it reduces synthesis of albumin in hepatocytes. High persistent levels of serum amyloid A and hepcidin lead to amyloid A amyloidosis and anemia of inflammation, respectively. In bone marrow, IL-6 induces maturation of megakaryocytes into platelets and activation of hematopoietic stem cells. In addition, IL-6 promotes the differentiation of osteoclasts and angiogenesis, the proliferation of keratinocytes and mesangial cells, and the growth of myeloma and plasmacytoma cells. Treg: regulatory T cells; CRP: C-reactive protein; VEGF: vascular endothelial growth factor; RANKL: receptor activator of NF-kappaB ligand. CRP is a good biomarker of inflammation and is used as such in clinical laboratory tests. Its expression mainly depends on IL-6 . If the free concentration of the anti-interleukin 6 receptor antibody, tocilizumab is maintained in serum at more than 1 μg/ml, CRP remains negative , so that the serum CRP level is a hallmark for checking whether IL-6 activity is completely blocked in vivo. Continuously high levels of hepcidin induced by IL-6 block iron transporter ferroportin 1 in macrophages, hepatocytes, and gut epithelial cells and lead to hypoferremia and anemia of chronic inflammation , whereas long-term high levels of SAA result in amyloid A amyloidosis . In lymphocytes, IL-6 induces B cell differentiation into immunoglobulin-producing cells . When CD4-positive naïve T cells are primed, a specific cytokine prompts their differentiation into an effector T cell subset. IL-6 together with TGF-β preferentially promotes differentiation of IL-17-producing T helper cells (Th17) that play a crucial role in the induction of autoimmune tissue injury, whereas IL-6 inhibits TGF-β-induced regulatory T cell (Treg) differentiation [13, 14]. The resultant Th17/Treg imbalance leads to breakage of immunological tolerance and is of pathological importance for the development of various autoimmune and chronic inflammatory diseases . IL-6 also induces CD8-positive T cells to generate cytotoxic T cells . The function of IL-6 in hematopoiesis is to induce maturation of megakaryocytes into platelets as well as activation of hematopoietic stem cells . IL-6 production in bone marrow stromal cells generates the receptor activator of NF-kappaB ligand (RANKL), which is an essential factor for the differentiation and activation of osteoclasts and bone resorption, thus leading to osteoporosis . Enhanced angiogenesis and increased vascular permeability are pathological features of inflammation, and these characteristics are due to the excess production of vascular endothelial growth factor (VEGF), which is induced by IL-6 in inflamed lesions such as seen in synovium tissue of rheumatoid arthritis . The promotional activities of IL-6, such as the proliferation of keratinocytes or collagen production in dermal fibroblasts, may contribute to autoimmune skin diseases including psoriasis and systemic sclerosis [20, 21]. Furthermore, IL-6 stimulates the growth of cells such as myeloma/plasmacytoma cells and mesangial cells [22-24]. IL-6 triggers signal transduction after binding to the IL-6 receptor (IL-6R) [25, 26]. There are two forms of IL-6R, a transmembrane 80-kDa form with a short cytoplasmic domain and a soluble form (sIL-6R). After binding of IL-6 to transmembrane IL-6R, the resultant IL-6/IL-6R complex associates with gp130 [27-29], and the activated IL-6 receptor complex is formed as a hexameric structure consisting of two molecules each of IL-6, IL-6R and gp130 (so-called a classical signaling) [30, 31]. The expression of transmembrane IL-6R is limited to a few cell types but the IL-6/sIL-6R complex can also transduce the IL-6 signal to various cells which do not express transmembrane IL-6R but express gp130 (known as a trans-signaling mechanism) , so that IL-6 affects a wide variety of cells. When IL-6 is synthesized transiently, it promptly participates in the host defense against environmental stress such as infection and injury and at the same time provides an SOS (warning) signal by triggering a broad spectrum of biological events. Once the source of stress is removed from the host, IL-6-mediated activation of the signal transduction cascade is terminated by negatively regulatory systems in conjunction with the normalization of serum IL-6 and CRP levels. However, dysregulated persistent IL-6 production has been implicated in the development of various autoimmune, chronic inflammatory diseases and even cancers [2-4, 33]. The reason(s) why such dysregulated continuous IL-6 production is induced remains to be clarified and elucidation of the mechanism(s) underlying persistent IL-6 synthesis in diseases is of particular importance to make their pathogenesis clear. It was found that in human immunodeficiency virus (HIV)-positive cases of multicentric Castleman's diseases all patients were infected with the Kaposi sarcoma-associated herpes virus (KSHV) and that sustained synthesis of both virus-derived IL-6, which directly binds to and stimulates human gp130, and of host-derived human IL-6 contribute to the development of the disease . Moreover, numerous animal models of diseases have also disclosed the pathologic role of IL-6 in disease development and that IL-6 blockade by means of gene-knockout or administration of anti-IL-6 or anti-IL-6R antibody can suppress such disease development either preventively or therapeutically. For example, IL-6 blockade strategy demonstrably limited susceptibility to Castleman's disease-like symptoms in IL-6 transgenic mice , as well as in various mouse models of rheumatoid arthritis [36-48], systemic lupus erythematosus [49-51], scleroderma [52, 53], C-peptide-induced myositis , experimental autoimmune uveoretinitis [55, 56], experimental autoimmune encephalomyelitis , and many other diseases. Because of the pathological role of IL-6 in various diseases, blockade of IL-6 was expected to constitute a novel treatment strategy for these diseases [3, 58, 59]. Consequently, a humanized anti-human IL-6R monoclonal antibody (chemical name: tocilizumab, generic name: Actemra outside of the EU or RoActemra inside the EU) was developed, by grafting the complementarity-determining regions of a mouse anti-human IL-6R antibody onto human IgG1. The resultant tocilizumab then blocks IL-6-mediated signal transduction by inhibiting IL-6 binding to transmembrane and soluble IL-6 receptors. Clinical trials of tocilizumab have demonstrated its outstanding efficacy for rheumatoid arthritis [60-66], systemic juvenile idiopathic arthritis [67-71] and Castleman's disease [72, 73]. For patients with moderately to severely active rheumatoid arthritis, tocilizumab is now being used as an innovative drug in more than 90 countries worldwide. As a monotherapy or in combination with disease-modifying antirheumatic drugs, it has significantly suppressed the disease activity and radiographically detected progression of joint deformity, thus improving daily functional activity. Tocilizumab was also approved as the first line biologic for the treatment of systemic juvenile idiopathic arthritis in Japan, India, USA and EU and for Castleman's disease in Japan and India. Furthermore, favorable results of recent pilot studies, case series or case studies have suggested that tocilizumab may have broad application for other diseases. These diseases include systemic autoimmune diseases such as systemic lupus erythematosus [74-76], systemic sclerosis , polymyositis , vasculitis syndrome including giant cell arteritis [79-84], Takayasu arteritis [79, 82, 85-87], cryoglobulinemia , myeloperoxidase-antineutrophil cytoplasmic antibody-associated crescentic glomerulonephritis  and rheumatoid vasculitis . The application of tocilizumab may also extend to organ-specific autoimmune diseases including Crohn's disease , relapsing polychondritis [92, 93], acquired hemophilia A , autoimmune hemolytic anemia [95, 96], as well as to chronic inflammatory diseases such as adult-onset Still's disease [97-113], amyloid A amyloidosis [114-120], polymyalgia rheumatica [79, 84, 121], remitting seronegative symmetrical synovitis with pitting edema , Behcet's disease [123, 124], uveitis , graft-versus-host diseases [126, 127], and tumor necrosis factor receptor-associated periodic syndrome  (Table 1). Some studies have reported that tocilizumab is efficacious for spondyloarthritis [129-135], although others observed only minor effects [136-138]. In addition, tocilizumab is reportedly effective for pulmonary arterial hypertension [139-141], atopic dermatitis , and sciatica . Finally, it was observed that during tocilizumab treatment of patients with rheumatoid arthritis, HbA1c levels and insulin resistance indices such as the homeostasis model assessment of insulin resistance (HOMA-IR) and the leptin-to-adiponectin ratio improved [144, 145], while serum levels of reactive oxygen metabolites decreased . It can thus be expected that long-term tocilizumab treatment may offer protection against the progression of atherosclerosis leading to cardiovascular events . Indeed, large-scale genetic analyses demonstrated a causal association between IL-6R-related pathways and coronary heart disease [148, 149], and a randomized, open-label, parallel-group, multicenter study to evaluate the rate of cardiovascular events of tocilizumab in comparison to a TNF inhibitor, etanercept in patients with rheumatoid arthritis (ClinicalTrials.gov, Identifier: NCT01331837) is now in progress. To establish broad clinical indications for tocilizumab for various diseases, however, further clinical studies will be needed to verify its efficacy and safety. The current clinical trials are listed in Table 2. Application of IL-6 blockade strategy for various autoimmune and chronic inflammatory diseases. Tocilizumab, a humanized anti-IL-6 receptor antibody, has been approved* as a biological drug for the treatment of RA, Castleman's disease and systemic JIA, and is expected to be applicable to various other autoimmune and chronic inflammatory diseases. RA: rheumatoid arthritis; JIA: juvenile idiopathic arthritis; SLE: systemic lupus erythematosus; RS3PE: remitting seronegative, symmetrical synovitis with pitting edema; GVHD: graft-versus-host disease; TRAPS: tumor necrosis factor-associated periodic syndrome. Clinical trials of tocilizumab for diseases other than RA. Current clinical trials of tocilizumab in the USA, EU and Japan are listed. GVHD: graft-versus-host disease; ANCA: anti-neutrophil cytoplasmic antibody. On the basis of the pathologic role of IL-6 and the outstanding beneficial effect of tocilizumab, targeting IL-6 is a rational strategy for the treatment of various diseases and other biologics of IL-6 inhibitors are also being developed . These include fully human anti-IL-6R, anti-IL-6R nanobody, anti-IL-6 antibody, and anti-IL-6/anti-IgG avimer protein consisting of the IgG-binding domain fused to the N-terminus of a 3-domain IL-6 binding region, which results in a 19-kDa heterotetrameric avimer. These novel biologics block IL-6-mediated both classical and trans-signaling pathway by inhibiting IL-6 binding to both transmembrane and soluble IL-6R. By contrast, the fusion protein soluble gp130-Fc selectively targets IL-6/sIL-6R trans-signaling pathway. It is hypothesized that IL-6 trans-signaling is a local and temporal danger signal with fewer and less important physiological functions under non-stressed conditions than classical signaling on the basis of several animal models [32, 150]. IL-6 participates in the host defense against environmental pathogens, whereas dysregulation of IL-6 production has been implicated in the development of various autoimmune and chronic inflammatory diseases [2-4, 33]. The pleiotropic activity of IL-6 also indicates that IL-6 blockade represents a rational treatment strategy for various diseases. A good example of the efficacy of such treatment is the dramatic improvement engendered by tocilizumab in amyloid A amyloidosis and anemia of inflammation through inhibition of their respective responsible proteins, SAA and hepcidin synthesis [151, 152]. However, the mechanisms through which tocilizumab exerts its therapeutic effects on various phenotypically different autoimmune and inflammatory diseases are not yet well understood. In recent years, it has been shown that Th17 and/or Th1 >> Treg causes the onset of various autoimmune and chronic inflammatory diseases [14, 15]. IL-6, in combination with TGF-β, promotes the differentiation of naïve T cells into Th17, but inhibits TGF-β-induced Treg differentiation, indicating that IL-6 is a very important factor for determining the Th17/Treg balance . Dysregulated IL-6 production leads to predominance of Th17 over Treg but anti-IL-6R antibody can repair this imbalance. It has been demonstrated in several animal disease models that IL-6 blocking suppresses antigen-specific Th17 and/or Th1 differentiation but induces antigen-specific Treg [47, 48, 55-57]. Furthermore, it has been shown that tocilizumab in fact corrects Th17/Treg imbalance in rheumatoid arthritis patients . In another study, it was found that tocilizumab induced a significant reduction in the peripheral pre-switch and post-switch memory B cells of rheumatoid arthritis patients  and that tocilizumab but not the TNF inhibitor significantly reduced somatic hypermutation in immunoglobulin gene rearrangements in pre-switch memory B cells , thus suggesting that modulation of memory B cells may be one possible target for tocilizumab. Moreover, tocilizumab treatment led to a reduction in the pathologic CD38highCD19lowIgDnegative plasma cells of SLE patients  and could lessen the survival of plasmablasts, which produce the anti-aquaporin 4 antibody in neuromyelitis optica . These findings suggest that the clinical effect of tocilizumab is also mediated through its inhibition of pathological autoantibody production. Because of the therapeutic efficacy of tocilizumab, IL-6 plays a major role in the onset or development of various phenotypically different diseases. IL-6 is produced by a panoply of cells including monocytes, macrophages, dendritic cells, T and B cells, neutrophils, mast cells, fibroblasts, synovial cells, keratinocytes, endothelial cells, stromal cells, mesangial cells, glial cells, neurons, chondrocytes, osteoblasts, smooth muscle cells, and others in response to various stimuli [2-4, 33]. Such phenotypic difference of diseases is conceivably due to differences in cells which generate IL-6 through abnormal transcriptional activation of the IL-6 gene [157, 158] and/or inhibition of IL-6 mRNA degradation [159, 160], or dose-dependent effects of IL-6 produced by cells recruited into the organs. Some virus products from KSHV, human immunodeficiency virus (HIV), human lymphotropic virus-1 (HTLV-1) and hepatitis B virus have been reported to affect IL-6 gene activation and/or mRNA degradation [161-168]. Therefore clarification of the cell source of IL-6 production and of the mechanism(s) through which dysregulated continuous IL-6 synthesis is induced constitutes an important issue for future studies into the pathogenesis of diseases. Tadamitsu Kishimoto holds a patent for tocilizumab and receives royalties for Actemra. Toshio Tanaka declares no conflict of interest. No assistance was provided for the writing of this manuscript. Corresponding author: Tadamitsu Kishimoto, Laboratory of Immunoregulation, Immunology Frontier Research Center, Osaka University, 8F IFReC Building, 3-1 Yamada-oka, Suita City, Osaka 565-0871, Japan. Tel. : +81-6-6879-4957 Fax: +81-6-6879-4958 E-mail: kishimotoosaka-u.ac.jp.